Commissioner Darrel J. Aubertine of New York’s State of Agriculture has announced a recall on certain batches of Dominican Bread, or “Pan Dominicano.” The bread is being recalled because of the presence of an undeclared allergen. “Pan Dominicano” is believed to contain milk, however the list of ingredients does not indicate it. Milk is considered to be a common food allergen and consumption of this food (in any form) could trigger an allergy attack, especially to those who are hypersensitive to it. Common symptoms of an allergy attack include skin itching and hives, reddish bumps, swelling of the mouth and lips, nausea, belly cramps, diarrhea and vomiting. To date however, there have been no allergy attacks reported that are linked to the recalled product. The problem was discovered through a routine sampling done by the state’s department of agriculture, in cooperation with market food inspectors. Successive analysis of the samples revealed the presence of milk allergens, which were not indicated on the product’s label. 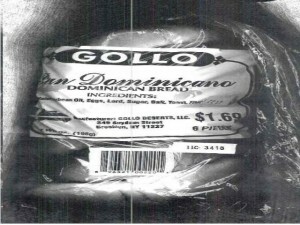 The recalled Dominican Bread, or Pan Dominicano, is packed in 7-ounce clear plastic retail bags. Each bag contains 6 pieces of bread. All recalled Dominican Breads have a UPC code of 96321-00220. This product has been distributed to different retail stores in the area of Long Island (New York), New Jersey and Connecticut. Consumers who may have purchased the recalled Dominican Bread are advised to either dispose of it or return it to the store where it was bought. Consumers can ask for a refund once they have returned the product. They may also call Gollo Desserts Bakery at their hotline 718-386-4110.